The South African automotive market is not awfully big in global terms. At fewer than 500 000 units a year (a fraction of the 70-million total global sales), you’d hardly table South Africa to boast a volume-leading vehicle segment, but it does: single-cab bakkies. Although the US remains, statistically, the world’s most robust market for bakkies of all types, most of the loadbox vehicle sales Stateside are of the double or extended-cab variety. South Africa, curiously, remains the most important – and testing – market for single-cab bakkies anywhere, followed by Australia, Argentina, Brazil and Thailand. As a workhorse delivery (or mining) vehicle, agricultural implement or artisan’s mobile office, the single-cab bakkie logically lubricates the industrial gears synchronising South Africa’s economy. Unsurprisingly, South Africa’s best-selling vehicle (outright) is Toyota’s Hilux. The undisputed segment leader for nearly as long as South Africa’s had colour television, Hilux is responsible for Toyota’s status atop the local vehicle sales charts. Increasingly, though, the world’s near-largest automotive brand, VW, is encroaching on Toyota’s once unshakable commercial vehicle market share. Less than a year after its local launch, VW’s Amarok has claimed 16% of the double-cab bakkie market, making it the Hilux’s most credible rival. Now VW is chasing after utility-minded buyers with the introduction of its single-cab Amarok. Mechanically identical to its double-cab sibling, VW’s range of Amarok workhorses aims to offer prospective buyers superior economy and carrying capacity paired with a level of comfort and safety never before available to local single-cab bakkie buyers. VW has launched the single-cab version of its first full-sized bakkie in six derivatives. There are two engine option are available (90kW and 120kW versions of the VW group’s venerable two-litre, four-cylinder turbodiesel) with either rear or all-wheel drive. Whereas the Amarok Basic is very much aimed at fleet and farm buyers, if you’d like a touch more comfort and convenience the Trendline adds auto aircon, a radio/CD player (MP3 capable), cruise-control, a trip data computer, passenger airbag and electric operation for all the Basic's manually actuated cabin features. Also distinguishing the higher-grade derivative are 16" alloy rims (rather comforting if you plan on off-roading beyond South Africa’s borders and run into an unfortunate succession of punctures), front fog-lights and chromed accents and colour-coded body mouldings. The Amarok single-cab’s chunky proportions are handsome and have substantial utility. Its loadbox is the most capacious in its class, being the only single-cab bakkie capable of accommodating two pallets crosswise. At 3.57m2, it’s 10% more voluminous than its nearest competitor and (quite embarrassingly) with the 90kW model rated to carry 1.25t and the 120kW Amarok 1.35t, it thoroughly bests Toyota’s D-4D Hilux, designed to transport a peak load rating of only 925kg. Simply put: point-to-point, you can load and move more with an Amarok single cab than almost anything else. The Amarok, then, is neatly styled and has class-leading loadbox dimensions and an outstandingly harmonised mechanical safety package. Its active (ESP and ABS-boosted interventions) are class-leading, though the passive (airbag) safety suite could do with optional side protection, which is not available. As a workhorse, though, is it really good enough to challenge the established Japanese market leader? 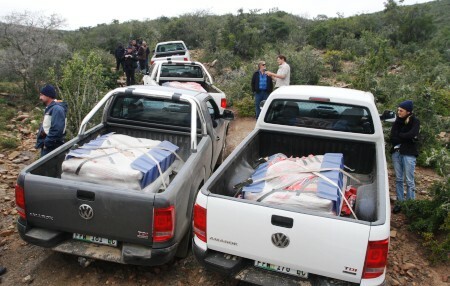 Well, to illustrate its confidence in the brand’s most important product to be launched locally for many a year, VW’s marketing personnel loaded 600kg of cement bags on each Amarok before setting the assembled media contingent on the customary ride-and-drive evaluation route. Meandering from Port Elizabeth into classic frontier country north of Grahamstown, we were afforded the opportunity to test Amarok single cab’s high-speed stability through the Ecca pass before slowing down for some off-road driving – all with the real-world burden of 600kg of deadweight in the loadbox. Unsurprisingly, considering it’s a mechanical facsimile of the double-cab, all the Amarok’s sophisticated engineering virtues are translated into a driving experience that is more reminiscent of a contemporary people-mover or SUV than a leaf-sprung workhorse. Even the basic models are superbly comfortable to drive, with ergonomically shaped seats, a suitably adjustable steering column and controls (both switches and drivetrain orientated) that are light to touch – very much unlike traditional bakkie fare, where robustness has always been underpinned by unwieldiness. The cabin architecture is generously dimensioned with a volume of stowage space behind the seats approaching extended-cab specification. 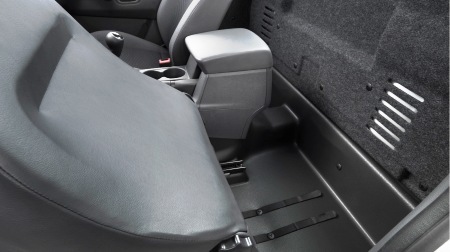 In fact, I managed to store three suitcases and a waterproof Pelican camera case behind the seats without much bother. IS A GOLF ENGINE GOOD ENOUGH? Although an exhaustive volume of criticism has been levelled (or conjectured, rather) at the Amarok’s small-capacity, high-output, two-litre engines, the fact remains that both its 90 and 120kW TDi turbodiesels provide the best possible performance/economy co-efficient in class. Boasting an 80-litre fuel tank (same as the Hilux D4-D), the Amarok’s additional sixth gear ratio and more efficient, yet similarly powerful, engine enable it to gain a substantial operational range advantage. In 120kW guise, a theoretical 1052km is possible tank-to-tank, better by more than 200km than the Hilux’s range of 800km. Hilux owners will be even more annoyed by the Amarok’s superior workhorse towing statistics, rated to haul a braked trailer of 2.8 tons, substantially better than the Japanese market leader’s rating of 1.5. With 600kg resting over the rear axle, the Amarok, 90 or 120kW, never felt short of urge as we headed towards Grahamstown outbound from Port Elizabeth. A quick (slick) downshift to fourth synchronises seamless torque delivery for overtaking, completed with a generous margin of safety when passing irritating truck traffic hovering just under the legal highway speed limit. Venturing on to the gravel-road portion of the ride-and-drive evaluation route, the impeccably calibrated suspension and quick steering enabled swift speeds without any nervousness; with the comforting thought of having both off-road calibrated ABS and ESP (the latter a market first for single-cab bakkies, but an optional extra at R4300) ready to intervene in the case of a loss of control. Having proved comfortable and swift both on tar and gravel, the Amarok’s only possible weakness could be in challenging off-road terrain – traditionally the Hilux’s field of dominance. 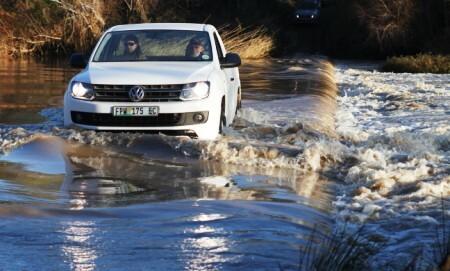 Descending to a Great Fish river in flood, crossing it and ascending a shale-strewn koppie (still haulin' those 600kg’s of cement) proved the Amarok single-cab’s 4x4 hardware to be well suited to local conditions. Boasting 2:72.1 low-range gearing and a proper mechanically locking rear differential, the off-road fundamentals are configured to please 4x4 traditionalists. The Amarok’s conventional 4x4 hardware is buoyed by a range of sophisticated driver aids too. 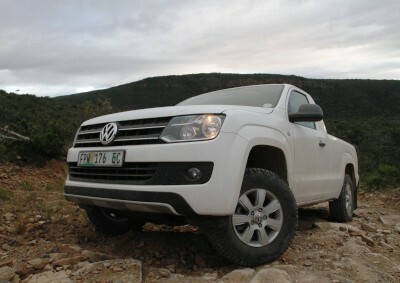 There’s an ABS-modulated traction control, far superior to traditional ECU power-rationing TC, terrain-based ABS, which shores up braking ability (and shortens stopping distances) on substrate surfaces and gravel roads and even hill-descent control; another Amarok first for the local single-cab bakkie market. The Amarok traction system intervenes on wheels which have surrendered grip by selectively pulsing the brakes and thereby vectoring torque to the drive wheel/s still in contact with the obstacle being negotiated. All things considered, the Amarok single-cab offers a range of off-road driver aids usually reserved for premium SUVs. Do all the off-road driver aid acronyms add-up to credible off-road ability though? The Amarok bakkies on the launch were each shod with Spirit of Africa specification 265/65/R17 Goodyear Wrangler AT-Rs instead of the standard 245/70/16. This is a change many double-cab Amarok owners are making post-purchase at their own expense to avoid the truck's off-road ability being compromised by tyre issues. Let's hope VW re-evaluate its position with regards to their customers' rugged off-road requirements and offers the Wrangler AT-R as a factory option. Whereas most single-cab 4x4 bakkies rely on skilled driving and experienced terrain evaluation from the driver, the Amarok is as effortless to drive off-road as a sophisticated premium low-range enabled SUV. Its turbodiesel engines are flawlessly calibrated to match their low-range gearing and TC/HDC, guaranteeing faultlessly controlled compression descents (even with a load in the back, descending at an intimidating angle) and wheelscrabble-free progress uphill. My litmus test for the Amarok single-cab was in the form of an 800m, shale-strewn incline, from the eastern bank of the Great Fish River to a ridge. The surface was broken enough to seriously challenge individual wheel oscillation and ground-clearance parameters. With low-range engaged, the Amarok climbed to the top at idling speed - no throttle input at all - with 600kg in the back and never sounding the least bit strained as the TC system synergised effortlessly with the engine’s output torque. Plainly, there was never once even the notion of having to possibly execute a hill-start and get going again from well down the hill if traction was compromised. So, the Amarok single-cab is close to faultless then? Well, nearly. For potential owners in isolated areas (especially farmers and engineering crews) the issue of fuel quality (especially condensation due to tanks left to "sweat" in the sun) will be a concern. VW says the engines will run on 500ppm diesel but prefer to compression-ignite 50ppm – and, if you wish, read that "prefer" as a euphemism for "strongly recommend". Although the loadbox design is (as mentioned) hugely capacious, it doesn't have tie-around points or thread-through loops on its outer rim. All the lashing points are embedded in the loadbox floor. I have no doubt VW’s accomplished engineers have an entirely rational (and Eurocentric) reason for this but it may take a while to convince a generation of bakkie owners, used to tying and fastening "over the top", of the Amarok’s "tie-down" superiority. With two-litre TSI petrol power promising to further enhance the single-cab range by the fourth quarter of 2011 (and auto transmission promised for the double-cab in 2012) the burgeoning Amarok range is sure to appeal to traditional bakkie owners who feel they have earned the right to ride in sufficient comfort (and safety) while getting on with the business of making South Africa’s most fundamental services work.